Train both heads of the bicep muscle to achieve symmetrical arms. 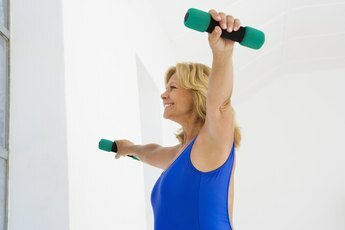 No woman wants to bare flabby arms so it's no wonder that biceps exercises are so commonly performed. But while training your biceps with weights can help increase their size, training them incorrectly can result in uneven-looking bicep muscles. To develop symmetrical biceps, it is important to use exercises that focus on both heads of the muscle. The biceps are made up of several muscles including the biceps brachii, the brachialis and the brachioradialis. The biceps brachii is the main muscle and is made up of two heads. The long head is in your outer arm and the short head is in the inner part of your arm. The long head of the bicep is used for every day activities and most training exercises. The incline dumbbell curl is an effective biceps exercise that strengthens both heads of the biceps brachii. Sit back on a 45 to 60 degree incline bench. Hold two dumbbells with your wrists facing your knees. Slowly curl your right arm up and rotate your elbow so that your palm with the dumbbell is facing your left shoulder. Lower your arm to the starting position and simultaneously lift your right arm to your shoulder. Continue alternating arm curls until you reach your desired amount of repetitions. Regular barbell and cable curls put more emphasis on the inner or long head of your bicep. Performing these exercises with a wider grip shifts the focus to the short head of the muscle, and thus helps correct muscle imbalance. Stand holding the weighted bar with an underhand grip. Position your hands so they are slightly wider than shoulder-width. Slowly curl the bar up until your elbows are fully bent. Pause briefly and extend your arms to return to the starting position. Perform three sets of eight to 12 repetitions of at least one wide-grip exercise in your biceps workout. Rotating your wrist while performing dumbbell or cable curls shifts some of the emphasis away from the long head of the biceps brachii to the short head. Hold a dumbbell or cable pulley strap in each hand. Curl one arm up and slightly twist your arm so that the pinkie finger is higher than your thumb as you are curling. Pause briefly when your elbow is fully bent and slowly extend your arm and rotate your wrist to the starting position. As you lower one hand, simultaneously curl your other arm in the same manner. Continue alternating arm curls until you reach your desired amount of repetitions. Perform three sets of eight to 12 repetitions of one rotated wrist exercise in your biceps workout. What Tricep Exercise Hits All Three Heads?